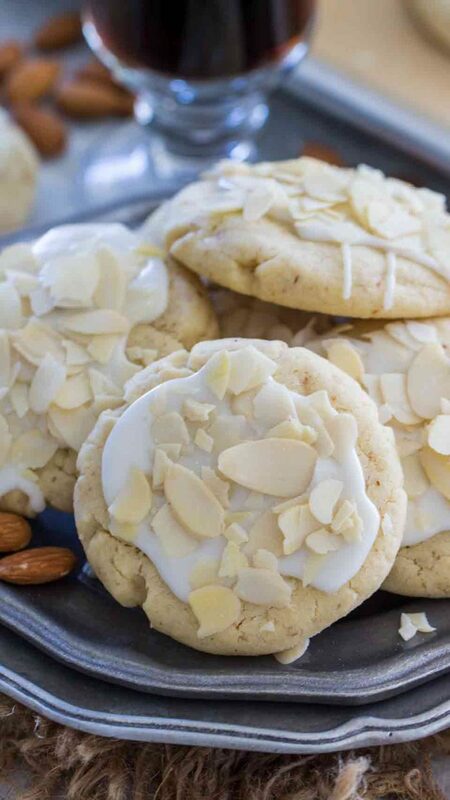 Buttery Almond Cookies are incredibly flavorful and so tender that they will melt in your mouth. Made with just a few ingredients, they are the perfect dessert. Delicious and buttery Almond Cookies are my weakness! 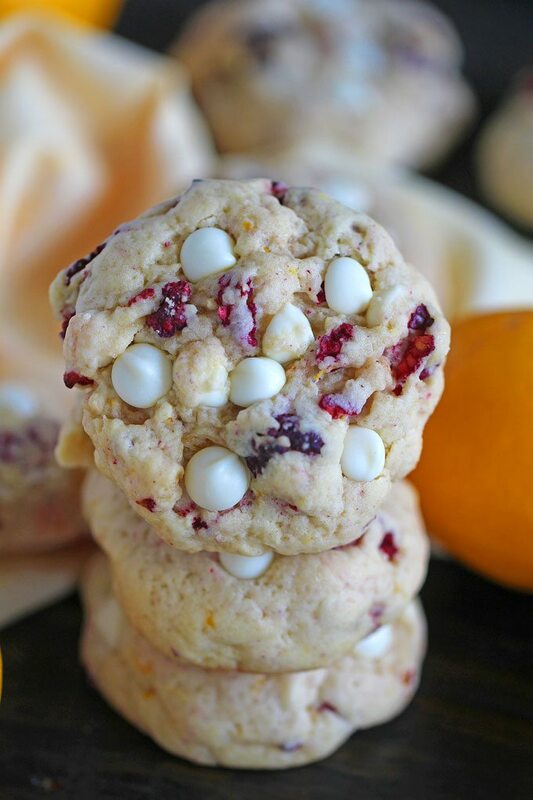 This recipe will become your favorite because it produces the most amazing, sweet, fragrant and tender cookies you have ever tasted. 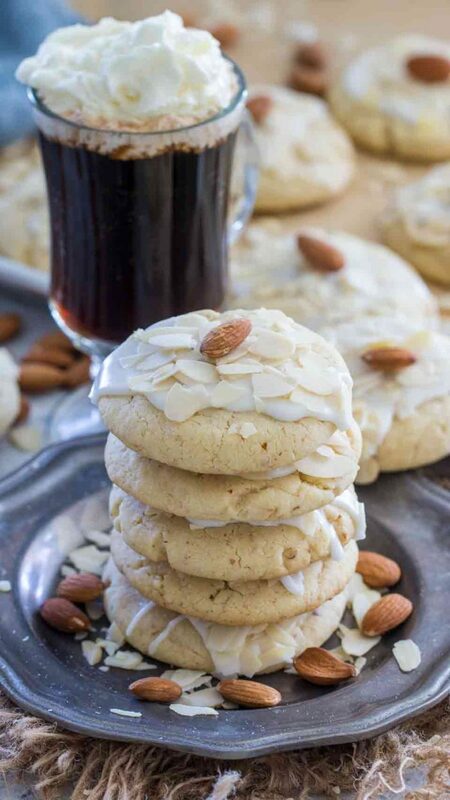 These Almond Cookies are made with ground almonds for extra texture and Amaretto liqueur or almond extract. 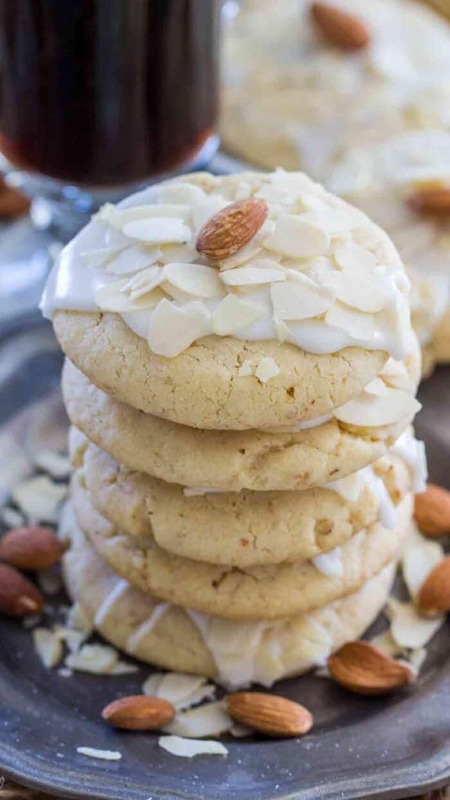 Topped with a sweet and luxurious glaze that has been infused with almond flavor and garnished with slivered almonds that add a nice crunch to the overall soft and crumbly cookie. These cookies won’t raise much when baked, they almost resemble a shortbread in texture and as a result they will break into delicious crumbs when you bite into them. 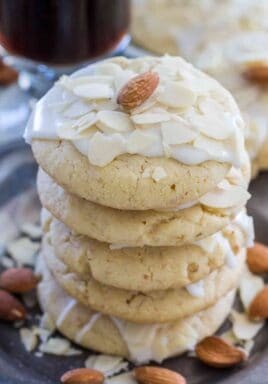 Do I need to add Amaretto liqueur to Almond Cookies? Amaretto is a sweet Italian liqueur flavoured from bitter almonds, while its very tasty when added to cookies, you can replace it with almond extract. What are Chinese Almond Cookies? The Chinese Almond Cookies have a special good luck component, each cookie has an almond embedded in the center which represents good luck. Also, the cookies are smaller and thicker in size and symbolize coins. Texture wise, the Chinese Almond Cookies are not as tender and buttery, they are sweet and crispy with a slight crunch. 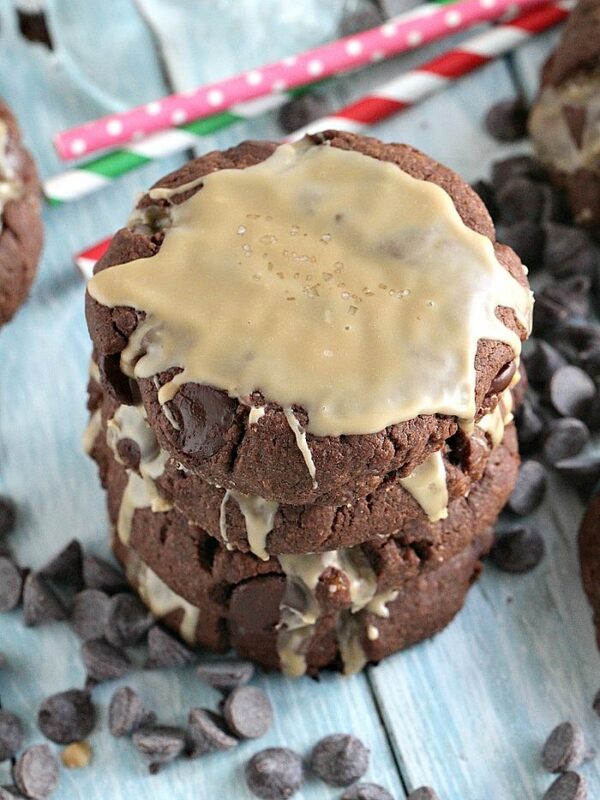 How to make Amaretto Cookie Glaze? To make the glaze you will need powdered sugar, Amaretto liqueur and milk or water. I personally prefer to use milk, for a creamier texture of the glaze. With these three ingredients you can make an easy, simple Amaretto glaze. In addition, you can replace Amaretto with almond extract or even vanilla extract. The full recipe is included below. Make sure you use unsalted butter and that the butter is at room temperature which consequently makes it easy to whisk. You have to be precise with you measurements, the recipe uses only a few ingredients and there is no much room for error. I like to use ground almonds to add extra texture and flavor to the cookies, however you can skip this if you prefer. Consequently if you choose to skip this, the cookies will be even more buttery, not as crumbly. You can use almond extract or Amaretto. The glaze is also optional, you can just add some slivered almonds on top of the cookies when you remove them from the oven. Be gentle with the cookies as they are tender, buttery and crumbly. Let them cool completely before moving them away from the pan and topping with the glaze. In a large bowl whisk together butter, sugar and Amaretto until fully combined and creamy. In a separate bowl whisk together the dry ingredients: flour, baking powder, ground almonds and salt. Add the flour mixture, 1 cup at a time to the butter mixture, and whisk until fully combined after each addition. Using your hands, roll the dough into small balls and flatten slightly. Bake for 7 to 12 minutes. It all depends how thick your cookies are. Start checking at the 7 minute mark, and if the sides and bottom of the cookies are slightly golden they are ready. Keep in mind that the top/center of the cookie will be soft, it will harden once the cookies cool down. Remove cookies from oven and let them cool on the cookie sheet. Once cool you can move them to a cooling rack, being gentle not to crush them. Wait for the cookies to be completely cooled before adding the glaze. Combine all the ingredients into a medium bowl until the mixture has no lumps. If the mixture is too thin, add more sugar, 1 tablespoon at a time. If the mixture is too thick, add more liquid, 1 tablespoon at a time. Drizzle a spoonful of glaze on top of the cookies and immediately sprinkle slivered almonds on top.